Friday Night: The 5th annual “Packers on the Patio” at Petrow’s from 5:00 p.m. until close. Classic cars are welcome, all Packers invited to attend. 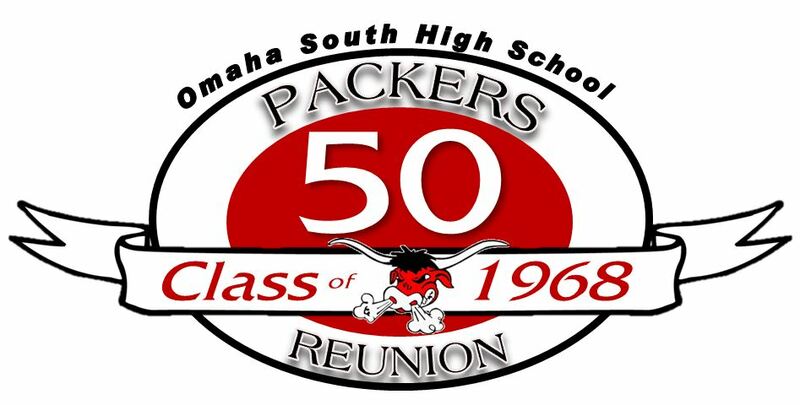 1968 alumni come share your photos from our 50th reunion. Cost: $15 per person in advance includes sandwich and one drink. Contact: RSVP to justcalljackie@gmail.com or Helene at 402-341-9356. Celebration of reliving high school memories on August 9, 10, and 11, 2018. The 1950 Baby Boomers = 50th class reunion and 1968 = 68 years old. Cheers to 50 years continued on with five enjoyable events. Our guest retired teachers were: Gym Trainer, Sharon Brown and English Teacher, Tipton Biggs. Classmate Jim Kluza officially took over the camera lens and some din on capturing every moment of all the Packer fun! Team Coordinators, Steve Bernth and Jackie Mahr led the Golden Oldies Crew Committees: Trudy Darling Ford, Joyce Brittan Clark Donna Minarik, Janet Veleradsky Raddesh, Jown Jelinek Stearnes, Kathy Fisher Thornton, Linda Olson Yourkoski, Jerry Olson, Jim Baker, Dennis Kelly, Tom Westman, Betty Wohlfarth Findeis, Rusty Findeis, Steve Barrett, Kathy Barrett (’69), Bo Hirnak, Cheryl Sparano Goodrich, and Helene Elsasser. Packers brought their own beverage and hopped on the “Pork Chop” trolley starting at Johnny’s Café. The infamous trolley guide, alumni Gary Kastrick (’70) gave a very personable, relaxing, and outstanding tour of South ‘O’. A stop over at Hollywood Candy (50’s & 60’s era) was another highlight of the tour. The tour ended at Johnny’s and the celebration continued with dinner and drinks on your own. Over 200 Packers packed the Patio at Petrows. Nick, our host, grilling our hamburgers, chicken and brats on a sizzling hot summer nite. Vinyl records and book covers were the table décor. Accented with vinyl record sculpture over the bar area. Elvis guarded the jukebox with 60’s background music for Fri. & Sat. nites. A Packers, 4-way split raffle with cash and door prizes. A $86 donation was made to the vet’s hospital. Photos were taken of classmates from other jr. high and elementary schools was a popular gathering activity. Along with videos displayed on double screens added to the atmosphere; the tribute to our vets, deceased classmates, and a variety of reunion photos were included. On the school tour, was led by Alumni and theater tech teacher-Dave Wiser (’98). Dave invited 60 Packers into his theater as guests. Packers listened intensely to Dave’s lecture over the school’s physical changes sine 1968. Also, he included the demographics, diversity, curriculum changes, and a short Q&A session. Dave’s mission statement was to educate the Packers on the ongoing Visual Arts Campaign Drive. Dave gave a very personable and awesome tour! The tour ended with buying lots of T-shirts at the bookstore! Regency Lake & Tennis was the finale of the weekend events. It was a 68th Birthday Party theme! An Italian Buffet with a fully stocked open bar that included Signature Drinks; The Valencia, Baby Boomer, Packer ‘50 and ‘68. 12 Birthday Gifts by months were the door prizes for the drawings. (t-shirts form the SHS bookstore). 3 birthday cakes were part of the celebration. An empty chair, decked out with ribbons as a tribute to our deceased classmates with their names and pictures on them. Ron Deyo, used his talent and expertise in coordinating the class photo on Regency’s patio as Packers sang ‘Happy Birthday’ to each other! Details: Cheers to 50 years, golden oldies 50th class reunion! The 5th annual “Packers on the Patio” at Petrow’s from 7:00 p.m. until close. Classic cars are welcome, all Packers invited to attend. What have you been doing? Write a short review about yourself to be included in our Reunion Memory Book. Submit it online at: http://classreport.org/usa/ne/omaha/shs/1968. Contact Tom Westman, our Website Coordinator, for web questions at email: twestman50@cox.net. For more information or reunion sponsorship opportunities (like sponsoring a round of drinks) or to just donate to a great weekend, please call our Treasurer, Jackie Buchholz Mahr at justcalljackie@gmail.com or Steve Bernth our Team Leader at 402-332-8139. If you or someone you know has not received our ‘Save the Date’, please contact Donna Minarik Krupko our Mailing Coordinator at krupko@earthlink.net. Friday Night: The 4th annual “Packers on the Patio” at Petrow’s from 7:00 p.m. until close. Classic cars are welcome, all Packers invited to attend. Cost: $15 per person in advance includes sandwich, side order, one drink and tip. Contact: RSVP to Tom Westman at twestman50@cox.net. Date: July 27, 2013 at DoubleTree by Hilton Omaha Downtown at 5:00 p.m. Details: Find your favorite tropical shirt/dress and flip-flops, and join us for a fabulous fun-filled evening with friends.